I came with one of my best friend in Secondlife, Silky, to a very good idea of an inter-blog story. A story taking place between two (we could even imagine more than two) blogs, each of the blog at its turn giving its side of the story. 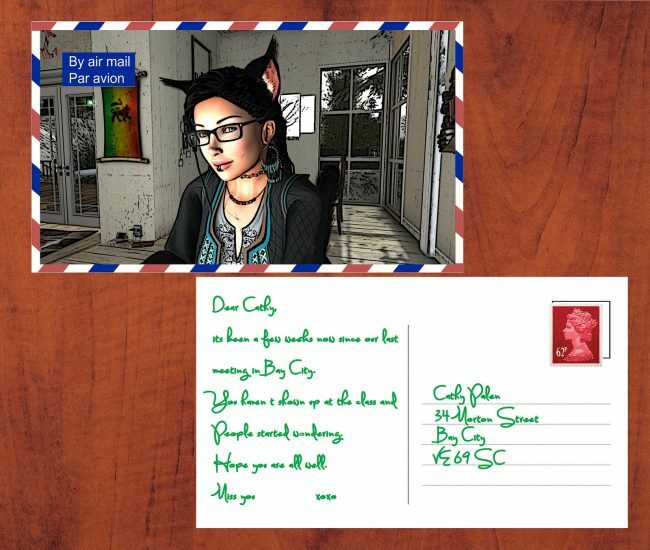 It is a bit like a standard roleplay you could find on SecondLife, but this time the various characters and stories are spread on different blogs. So you will find below an attempt to put that in motion. At the moment it is just Silky and me. Silky had the idea to use picture postcards to support the story, and so we went for it … some other supports might come soon or later, you will see. Let us know what you think, we are both very excited by this new adventure. I woke up quite late that morning, the night had been long and enjoyable … all these nights at the club have exhausted me, day after day. Happily my contract here was coming to an end and I was definitely relieved to come back to Bay City soon. I was a bit sad too, my time here had been so nice, I knew I will miss the sun, the beach and the friends I made here … and a few lovers too. I dressed quickly and decided I would have my breakfast in the little cafe on the opposite side of the streets where I rented my tiny apartment. I passed by my mailbox and collected my mail. It took time but my mail transfer seemed to work now. Today only one postcard … it was from Silky. I felt immediately guilty not having told her when I left Bay City … I left so quickly. I had no excuse really. I was sipping my coffee, thinking at Silky, Bay City … the dance school and … this incredible dare I put myself into there (see a long stroll in the streets). I smiled to myself. When I finally came back to my flat, I took a quick shower and went at my table to write a little answer to Silky.